Calling today for continued internal commitment to assist Central African Republic, the United Nation’s High Commissioner for Human Rights Navi Pillay said that “We simply cannot let the social fabric of this country be torn apart.” Ms. Pillay’s appeal comes after CAR swore in a new interim president last week. Catherine Samba-Panza, a private industry figure who was appointed mayor of Bangui last year, has now become the second interim president since nominally Muslim rebels overthrew President Francois Bozize last March. The leader of the Seleka rebel movement, Michel Djotodia, was subsequently elected interim president by the country’s Transitional National Council (TNC), because resigning from the post and going into exile earlier this month. Interim President Samba-Panza now has the difficult job of trying to end the crisis that has killed an untold number, displaced almost a million, and could lead to a potential food security crisis according to the UN’s Food and Agriculture Organization. Some food aid has begun being delivered in the capital, but the UN’s World Food Program says it is only a fraction of what is needed. Interim President Samba-Panza has called on Christian and Muslim communities to work together for peace and end the inter-communal violence in the country. Though there has been some good news on this front, looting and violence by nominally Christian militias, referred to as anti-balaka, occurred on the very day she was sworn in. This also highlighted the continuing insecurity in the country as looters were driven off by Rwandan peacekeepers, but returned after those peacekeepers were compelled to depart to guard the swearing in ceremony. International peacekeepers have succeeded in at least moving ex-Seleka rebels out of the capital, Bangui. It was reported that the former rebels left Camp de Roux, which had functioned as the country’s main military base in the capital prior to the ouster of President Bozize, after peacekeepers escorted some of their leadership out of the city. However, this was then reportedly followed by other Muslims fleeing as well, fearing retributions. It also remains unclear what this might mean for other groups of former Seleka fighters. The rebel movement was, like many in the region, loosely organized with little in the way of a formal hierarchy and chain of command. This became particularly evident when Michel Djotodia effectively failed in his attempt to disband the group after being elected interim president. The United States has said it may place sanctions on anyone or any group found to be standing in the way of peace and reconciliation. 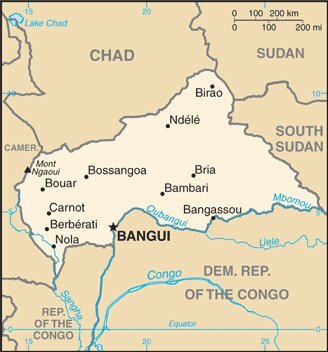 Only time will tell whether the new administration in CAR can move the country forward, with or without international help. This entry was posted in Uncategorized and tagged anti-balaka, CAR, peacekeeping, Seleka. Bookmark the permalink.